Southern magnolia (Magnolia grandiflora ‘Exoniensis’) blooming in the Arboretum in August. The Washington Park Arboretum features one of the larger public collections of magnolias in the United States. Currently we have over 250 specimens representing 34 magnolia species, four subspecies and varieties, and 65 cultivated varieties. These include many summer-blooming trees, including a southern magnolia (Magnolia grandiflora) that dates back to 1938. 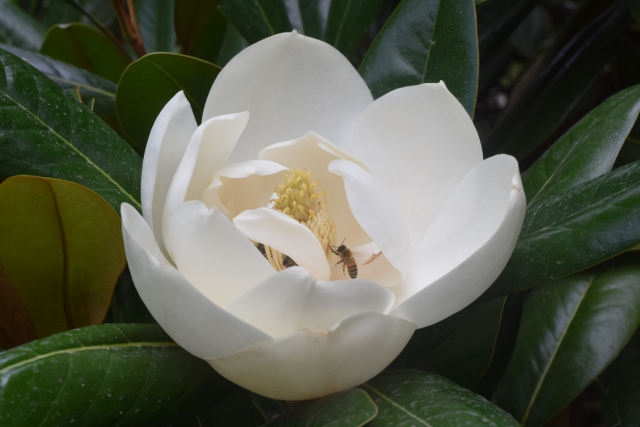 In the latest issue of the Arboretum Bulletin, UW Botanic Gardens Curator of Living Collections Ray Larson provides an overview of the magnolia collection. He discusses the history of the collection, and how it has influenced magnolia cultivation on the West Coast and beyond. He also highlights some new and unusual species that we’ve been trialing in recent years.